Senator Ahmed Zanna, who is Mr Bama's uncle, denied the commander had been arrested in his home. The incident has fuelled suspicions that some politicians are helping the militants. 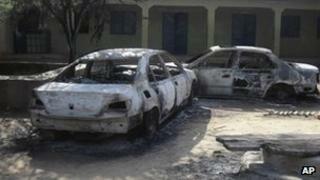 It comes as several people were killed in a suspected Boko Haram attack. Gunmen stormed the home of a retired head of customs in the town of Potiskum, taking him away with his son and then shooting them both. Potiskum has witnessed days of gunfire and bombings and several targeted killings in recent days. Mr Bama was arrested in Maiduguri earlier this week, the army said. A military spokesman said that he was suspected of organising recent attacks in the region. The army's claim that Mr Bama was held in a senator's house has once again fuelled the debate on whether politicians are helping the Islamist group, the BBC's Nigeria correspondent Will Ross reports. Last year, another senator, also from Borno state, was arrested and charged over links to Boko Haram. The senator denied any wrongdoing and was later released on bail. However, analysts suggest that some politicians in northern Nigeria are prepared to side with the militants in order to discredit the government of President Goodluck Jonathan, who is from the south of the country, our correspondent adds. Nigeria is roughly divided between a largely Muslim north, and the south, where Christianity and traditional religions dominate. Attacks in central and northern Nigeria blamed on the group have killed some 1,400 people since 2010.